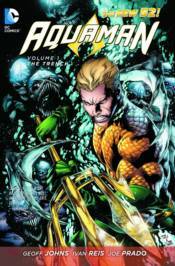 � The first collection of the new AQUAMAN series, now in trade paperback! � The superstar creators from BLACKEST NIGHT and BRIGHTEST DAY reunite to take AQUAMAN to amazing new depths! � AQUAMAN has renounced the throne of Atlantis - but now, from a forgotten corner of the ocean emerges�THE TRENCH! � Collecting AQUAMAN #1-6!